The Paddle Palace Water Bottle has a push-pull lid and holds 20 oz. 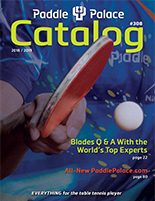 Red with white Paddle Palace logo. Ok, I'm biased but I love these! Ok, I'm biased since I designed these. But I love these water bottles. I like the red color and it makes the white Paddle Palace Logo pop. The water bottle is easy and functional to use. The top stays tight and there is no leakage in my table tennis bag. My 20-something daughter carries one of this same type of bottle everywhere and she says it is the best kind. She's my guru.